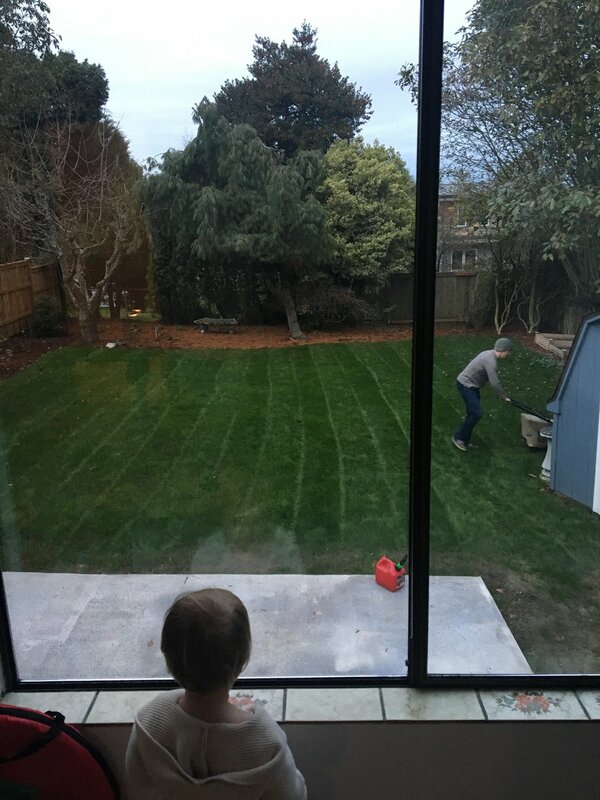 For the past year, I've been paralyzed by the amount of work that needed to be done to make our backyard useable as an entertaining space. My wife, Jenn, and I had grand visions for that jungle but goodness, where should we begin? We dreamed of hosting dinner parties on our non-existent patio, late night conversations around a fire, sitting back and watching our daughter chase after our poor, tormented dog. But there was just SO. MUCH. STUFF. My mother-in-law would remind us, “Just a little bit at a time. You’ll get there.” And this weekend, it felt like we had arrived. Giant rhododendrons: The logical place for a patio was right below the playroom but that space hosted five (FIVE!) giant rhododendrons that the previous owner planted probably 40+ years previously. My wife loved those shrubs (that resembled tress) and the history they held so it took some convincing to get her to agree to part with them. But when it came down to what was most important to us, we knew we wanted a dedicated space to host friends and family so out those bushes went. We trimmed them back ourselves last fall and had a professional dig out the ginormous roots before pouring a concrete patio. 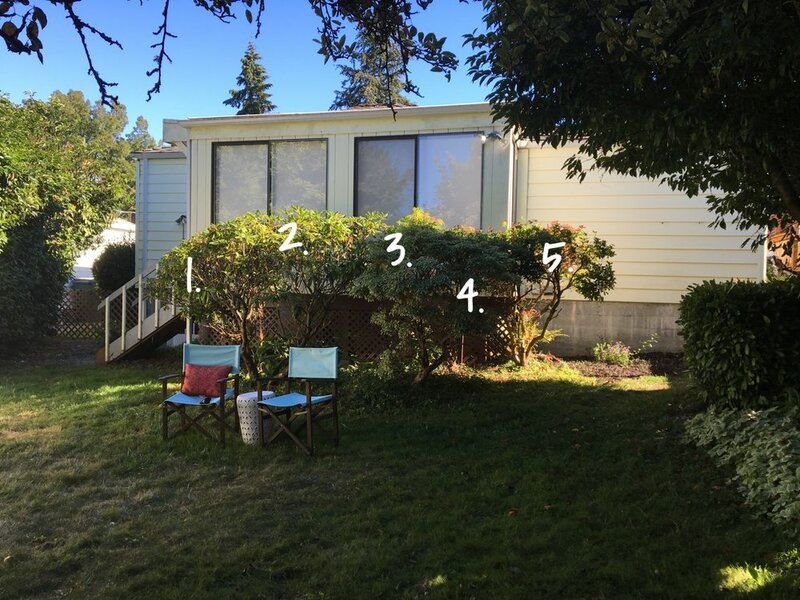 The damn concrete patio: Our lot is roughly 7,000sq ft (which is fairly big for Seattle and laughable in most other states) but it does have a slight slope toward Lake Washington. This meant that when they poured the concrete patio, they had to pour it super thick on one side to keep the patio level. I’m talking 4-5 inches above ground on one side. Translation: this cost a lot more money than anticipated... like the total was less than $3,001 and more than $2,999. OUCH. It was our most painful lesson in our reno story yet. Probably should have just gone with pavers… or gravel. Gravel would have been a lot cheaper. Outdoor furniture: Before making any big decision, Jenn likes to do her research (spreadsheets and Consumer Reports magazine are often involved.) Picking out the patio furniture seemed agonizing to her but I tried to remain patient. I understood her plight – most outdoor furniture is fairly hideous, wildly expensive and frankly, there are just a lot of options. That’s why we were so stoked when we found the ÄPPLARÖ line at Ikea. It checked all of our boxes: affordability, versatility, and durability (at least according to some blog reviews that Jenn noted in her spreadsheet.) We loved that the chairs reclined into 5 different positions and folded up for compact storage in the winter. The bench would be perfect for relaxing in front of the fire pit and the table could seat between 4-10 people with the fold-up extensions. We scored four chairs, one loveseat/bench and a table for under $500 (tax included). We wasted no time putting the space to good use. Our friends arrived for an Easter dinner minutes after we tightened the last Ikea screw. We gathered 6 adults and 3 children all around the table and stayed up way too late talking and laughing around the fire pit. While this project took longer than we hoped and cost more that we planned, our revived outdoor space has been a dream come true. Want to know how to get your home in shape to sell? Download my free Guide to Selling a Home for all the best tips and tricks.